Consumer surplus is the delta between what consumers expect to pay or are willing to pay for an item and what they actually have to pay given market dynamics. A good example of where we are generating a lot of consumer surplus is technology. I would be happy to pay for my email (and do) but I can get it for free from Gmail. A 49″ smart TV sells for about $300 on Amazon. A Samsung Chromebook is $200 on Amazon. I like to think of all of this “found money” that consumers are getting from technology as the dividend we are getting from the technology revolution. It is also true that technology takes jobs out of the market, and adds them too, and that it may be a zero sum game or worse. But the truth is many things have gotten a LOT less expensive over the last twenty years and that has made managing the household budget a fair bit easier. My colleague Nick sent me this chart yesterday. I don’t know where he got it so I can’t identify the source. 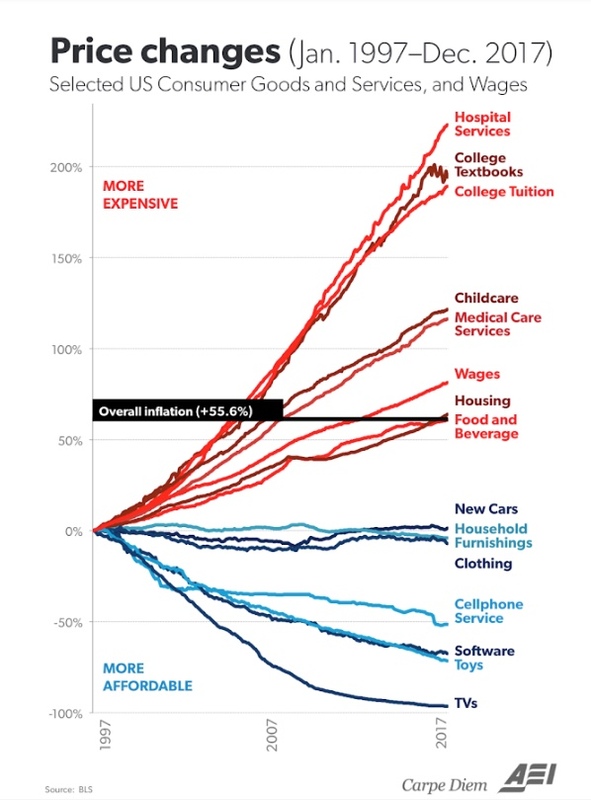 What you see from the chart is that wages have increased about 70% over the last twenty years and many things, including housing, food, clothing, and most dramatically technology, have increased less, or have actually gone down in price, creating room/surplus in the household budget. But not everything has gone down. Health care and education, most notably have increased dramatically. So it is time to take aim at those sectors. We can do the same with education that we have done with other services. And we will. I feel that healthcare will be a harder lift, but I do think it can be tackled too. In fact, our current thesis at USV compels us to go after these sectors. So we will. I am excited about the potential to bring consumer surplus to these sectors and make more room in the household budget in doing so.